Join the Nsefu team in Zambia for the Global March for Elephants and Rhino. The event takes place on Saturday, May 4th from 1pm to 3pm. 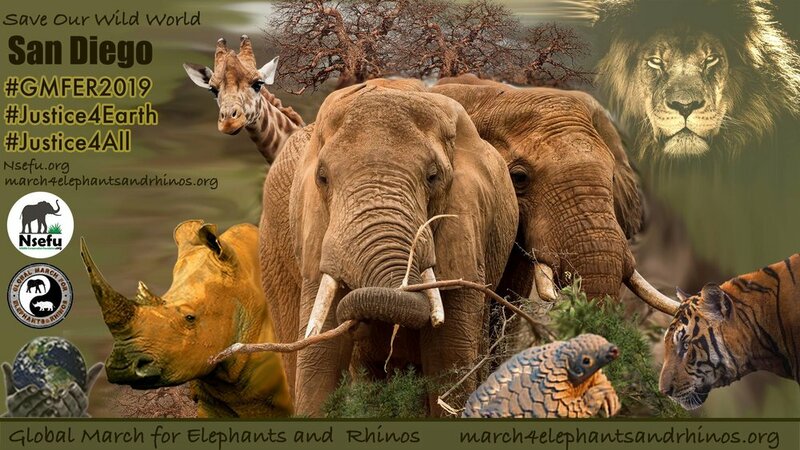 For the 5th year in a row San Diego will march with over 100 cities WORLD WIDE to raise awareness to END poaching of our precious elephants, rhinos and wildlife. ALSO to influence CITES (Convention of International Trade of Endangered Species) to vote to maintain the highest levels of protection for wildlife. CITES is comprised of delegates from 182 countries meeting in Sri Lanka at the end of May. 1. Exempt endangered species from trophy hunting. 2. Demand Japan and EU close their domestic ivory trade. 3. Ban endangered animals from captive breeding. 4. Upgrade elephants and giraffes to the highest level of protection. 5. Reject proposals from Botswana, Namibia, and Zimbabwe to sell their legal ivory stockpiles and Zambia's proposal to loosen protection of elephants. 6. Ensure transparency of permits regarding trophy hunting.